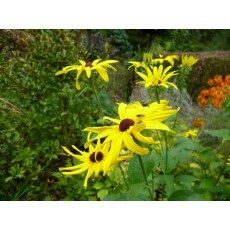 Flowering from early August to late September it is a valuable addition to the late summer garden. 1.7m x 1.3m clumps produce single flowers up to 8cm diameter with pointed golden yellow petals, the tips of some being twisted or turned back, giving them a slightly ruffled look. It does well in full sun, but will tolerate some shade and requires moisture-retentive soil. Clumps may be divided in spring or autumn. Young foliage is susceptible to snails and slugs and growth is weak in dry conditions. 0 Comments To "July's Featured Conservation Plant"